OSWEGO, NY – Statistics show that 1 in every 8 women will develop invasive breast cancer over the course of her lifetime. This year, around 39,620 women and 410 men are likely to die from breast cancer in the United States. For Oswego County Opportunities’ Cancer Services Program Partnership those are unacceptable numbers, and ones they are dedicated to reducing in Oswego County. 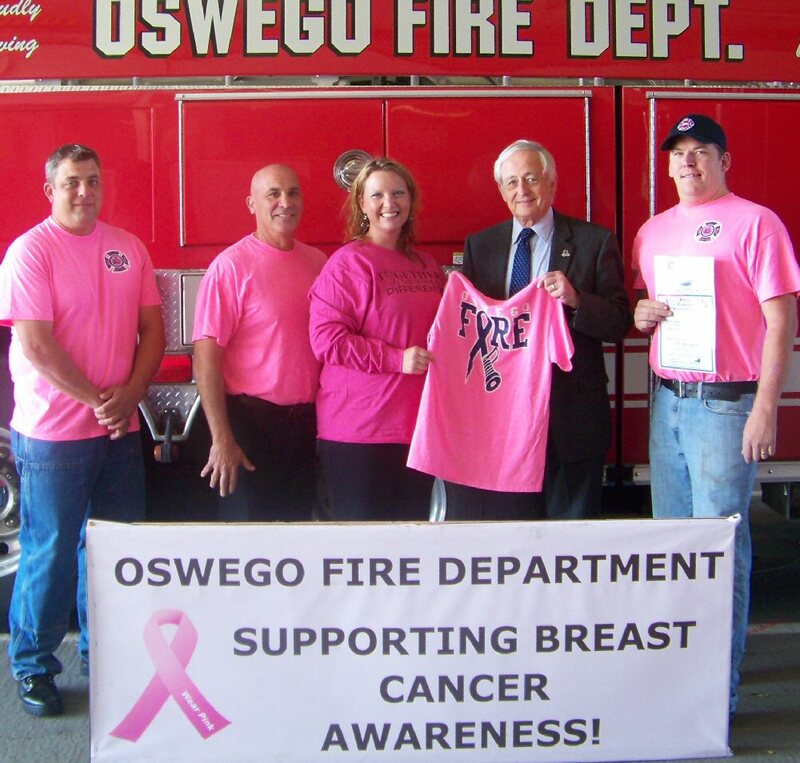 Oswego Mayor Tom Gillen displays an Oswego Fire Department breast cancer awareness Pink T-Shirt. In recognition of Breast Cancer Awareness Month, the Oswego Fire Department IAAF Local #126 is selling the shirts throughout October. From left are: firefighter and president of IAFF Local #126 John Geraci, Fire Chief Jeff McCrobie, Cancer Services Program manager Carolyn Handville, Mayor Gillen and firefighter Carl Emmons. In recognition of October being National Breast Cancer Awareness Month, the Cancer Services Program has begun a month-long campaign aimed at increasing the awareness of the importance of obtaining annual clinical breast exams in the fight against breast cancer in Oswego County. Carolyn Handville, program manager for the Cancer Services Program Partnership, said that the Oswego City Fire Department is once again helping to get the campaign off to a fast start. Firefighter Carl Emmons, who is leading the fire department’s breast cancer awareness campaign, said that the IAFF Local #126 is joining with IAFF members across the United States and Canada to suit up in pink and are selling pink T-shirts to raise money for OCO’s Cancer Services Program. “The Oswego Fire Firefighters’ IAFF Local #126 is proud to be a part of this national effort. IAFF affiliates can be effective advocates for breast cancer awareness and prevention. We encourage others to give so that no breast cancer patient goes without life-saving treatments they need today and the promise of a cure for tomorrow,” said Emmons. “I’m very appreciative of the fact that the Oswego City Fire Department recognizes our efforts and chose to support us in this way,” said Handville. Emmons said the Oswego Fire Department Pink T-Shirts would be available during the open house that the East Side Fire Station will be hosting on Saturday from 10 a.m. to 4 p.m.
“The fire station will be open for tours, and there will be lots of fun for the kids with face painting, balloons and free refreshments. Additionally, there will be several demonstrations and presentations and other public safety agencies will be on hand as well,” said Emmons. 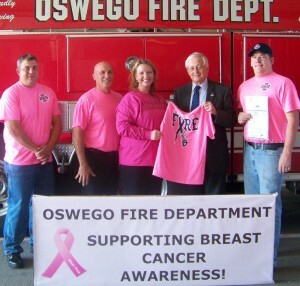 Oswego City Fire Department pink shirts are available at the East Side Fire Station, 35 E. Cayuga St. in Oswego, Monday through Friday from 9 a.m. to 1 p.m. and at the Fulton Medical Center, 522 S. Fourth St., Suite 500, Fulton, Monday through Friday 9 a.m. to 4 p.m.,, while they last. All proceeds from sales of the pink T-shirts will benefit the Cancer Services Program Partnership of Oswego County. Administered by OCO, the Cancer Services Program Partnership of Oswego County provides free cancer screenings including clinical breast exams, mammograms, pap/pelvic exams and colorectal cancer screenings to community members who are both uninsured and between 40 and 64 years of age. OCO is a private, non-profit agency that has been supporting communities throughout Oswego County since 1966. A member agency of the United Way of Greater Oswego County, OCO provides more than 50 vital services throughout 80 separate locations.